So now that we're all clear on what I did not do this weekend, I'm going to fill you in on what did happen. Because it was kind of a crazy time, and not at all what I expected, and I learned a bunch from it and also am kind of wondering if my arm is maybe broken because it's starting to turn all blue and swell up more. And there were fun and funny things, too. I'd gotten an email on Tuesday about a private event being held at a local high school (the school was being given a huge grant for their music program and the Tenors were coming to sing at the ceremony). I was hanging out with Karlie, who loves the Tenors, and asked her if she wanted to go and she was all over it. So I RSVPd that I'd be coming with my partner (who I 'hired' for the day so that she could come too) and Thursday morning found us sitting in the front row VIP seats along with the mayor of Regina and the president of the Juno Awards and a few other media outlet reps. We had a press kit and a tall guy named Mike who was assigned specifically to us to help us "get what we needed" and it was all very nice. So we watched the show from the floor at The Tenors' feet with some lady from CKRM who was also taking pictures, because we could. Because Tall Mike said we could. Tall Mike was the best. After the show, I cornered a girl named Nicole who'd just been awarded some pretty sweet musical instruments for her school's band program because I wanted to ask her some questions for my article. Tall Mike appeared just as we were getting started and motioned at me. "You'll have to wrap this up," he said. "We've gotta go." Already? I thought. Tall Mike is the worst. So I smiled at Nicole and wrapped up the interview and gathered my folder and my iPhone that I was using as a recorder and Karlie and I followed Tall Mike through the crowd, presumably towards the exit. And then without very much warning at all I was standing in front of Clifton Murray, of the Tenors, and Tall Mike was saying, "Okay, Clifton, we got one more interview here. You got five minutes. This is Suzy. Take it away." And I don't think I've ever been more caught off guard in all my life, but I automatically shoved my iPhone recorder in that guy's face and started grilling him like I was Jian Ghomeshi. But a smaller, whiter, girlier, much worse, much less prepared version of Jian Ghomeshi, though. 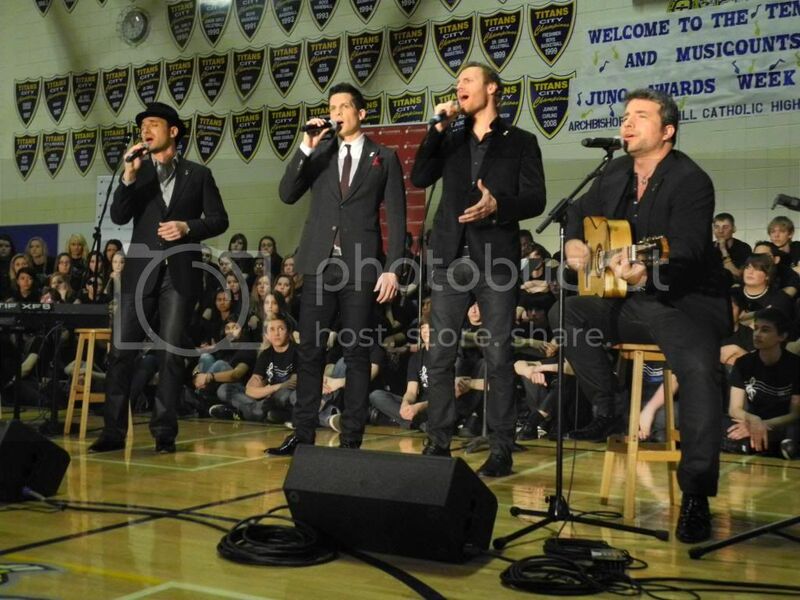 And as I was asking questions about The Tenors' involvement in MusiCounts and the importance of music programs in high schools I was thinking, "Good graish, is my voice, like, ten octaves higher than normal or what?" Clifton didn't seem to notice though. He liked talking into my iPhone. We talked for the whole five minutes with no awkward pauses. I looked at him. He reminded me of an eagle; an eagle with too much hair gel. Tall Mike showed up right on time and took him away to get his picture taken, and I breathed for the first time in five minutes, exactly. Being prepared is definitely ideal, usually. Anyway. The rest of Thursday was largely uneventful, work-wise, but good. I dropped Karlie off at home and ran over to the Juno office to pick up my media badge so that I could get into the rest of the week's events. Barclay took me to a live taping of Q (of which the aforementioned Jian Ghomeshi is the host), which was fantastic and wonderful and everything I'd ever hoped and dreamed it would be. Oh AND. Speaking of Jian Ghomeshi, I ran into him later that night. He had his entourage with him and they were speed-walking through the crowd because they apparently needed to be somewhere very soon. But as he passed me, he slid to a stop, doubled back, and grabbed me by my shoulders. "OH HEY!" He shouted. "How are you?" Because we are best friends. Because life is beautiful.